That have come to haunt me from the 60s. These things just won't stay away! Before the concept of "vintage" we would take Dan Electros and put them in a tuxedo. We'd peel the tape, do a nice paint job and put some good appointments on. The tele bridge and pickup I added in the late 60s. It was probably something off a '64 tele. of early American stuff. 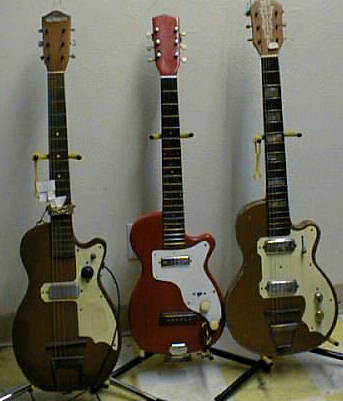 In the infancy of electric guitar development, Harmony and Kay came up with creations like these. Alot of old blues was recorded on instruments of this type. 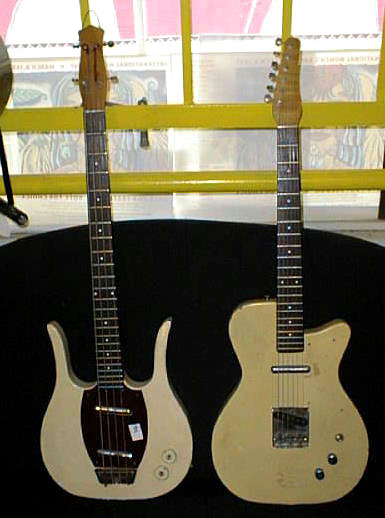 Supro and National -- and many other companies -- didn't make their own bodies in different periods. 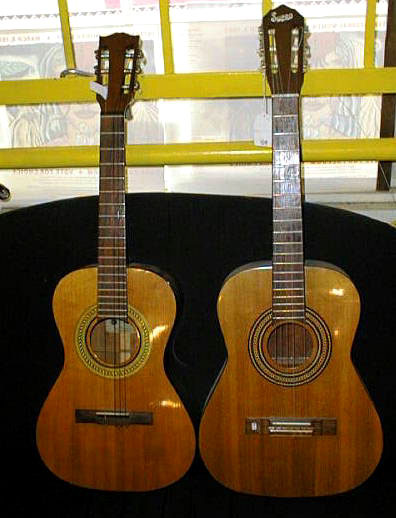 They'd contract with companies -- like Gibson -- to supply the body, as in the classic on the right. 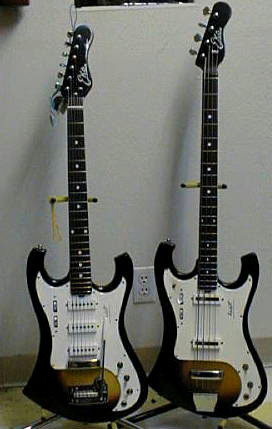 The left classic is a unique 3/4 size Gibson/Kalamazoo Epiphone from the mid-60s. We got all these old Martin necks and bodies years ago that had miniscule, microscopic cosmetic boo-boos -- or were just "research" pieces. We assembled at least 140 of these instruments and sold them pretty cheap. We did a good job -- Schaller gears, compensated bone saddle, and interesting vintage finishes. Then a multi-national chain (that shall remain nameless) snivelled to Martin for them to cut us off, mainly because we would sell a guitar like this for about $600. This one I actually made for a boyhood buddy of mine -- Bobby Raylove. After he had it for a few years, he realized he needed a D-28, rather than a Subway 000-18. I'm selling this one for $700 with a hard case.